Location: The Sandusky Sailing Club is situated on Sandusky Bay, the top sailing venue on the Great Lakes. The entrance to the Club is behind the tennis courts next to the City Building at 222 Meigs Street in Sandusky, Ohio. Click Here for Directions. 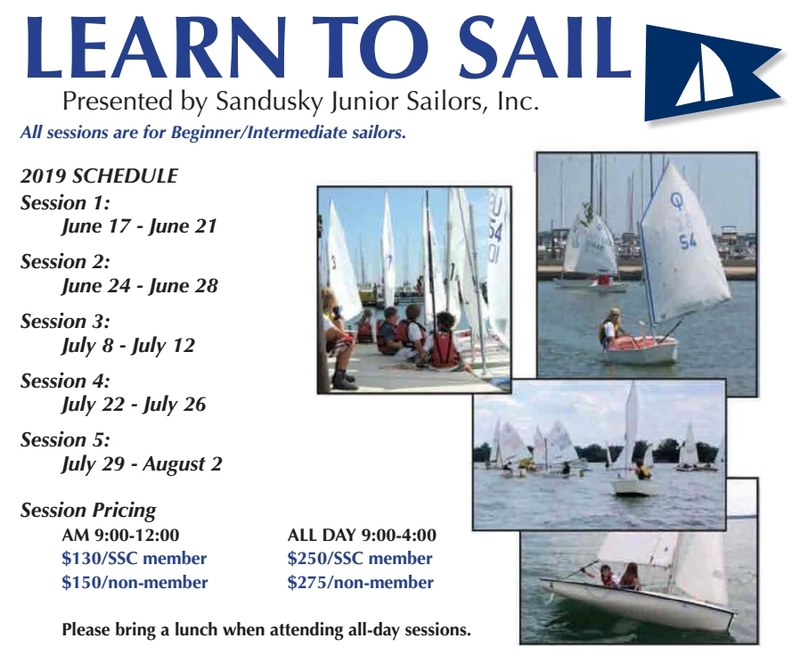 Below are the session details of the 2019 Youth Learn to Sail Program. Please follow the link below to the online registration system and to contact our Program Coordinator. All sessions are for children 7 years of age and older with beginner-to-intermediate level experience. The Program Director and Instructors will assess student ability and will separate the students into a beginner group and an intermediate group according to skill level and ability. Beginner instruction will focus on water safety skills, rigging and de-rigging boats, nautical terms, knots, and elementary sailing skills. In the intermediate class, the emphasis will be on building the child's confidence in boat handling skills, including skippering the boat, learning sail trim, learning the sailing and racing "rules of the road" and an introduction to racing. Students are invited and encouraged to participate in as many sessions as possible. Registration for each class will be limited to 25 students and will be accepted on a first come first serve basis. Life jackets will be worn at all times when on or near the water. There will be a swimming test given by the instructors on the first day of class. All students should know how to swim with and without a life jacket. Prompt arrival and pickup will be expected. Our instructors cannot be responsible for watching participants prior to or after class times. Pay attention to the weather and send your child dressed accordingly. Proper attire should include a swimsuit and closed toe shoes. Also, needed every day will be a towel, a change of clothes, a sweatshirt or light jacket, life jacket, hat and sunscreen. It is highly recommended that sunscreen be applied to all areas not covered by your child's bathing suit before he/she leaves home. Classes will be held indoors if necessary due to inclement weather. Please bring a lunch when attending All Day Sessions. Bandannas and certificates will be awarded to students who successfully complete the program.